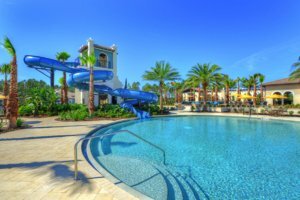 Tamaya is a 780-acre master-planned community located on Jacksonville’s Beach Boulevard, between Kernan and Hodges Boulevards. A gated entrance and impressive new signage leave no doubt where you are once you arrive. As Tamaya neighborhoods come online, an impressive model village gives you a real-life look at all your choices. The model village also is a great place to glean ideas and inspiration. Tamaya’s siting makes it easy to get anywhere in metropolitan Jacksonville. The beach lies six miles east. The University of North Florida is only 5 miles away. The St. Johns Town Center shopping enclave is six miles southwest, as is Interstate 295 — Jacksonville’s beltway that links you with I-95, Florida’s main north-south artery, and with I-10, its east-west artery that begins in “JAX” and ends at the Pacific Ocean in Malibu, California. Let’s start with the 10,000-square-foot Resident’s Club. It is a community center, but banish all those “rec room” stereotypes. 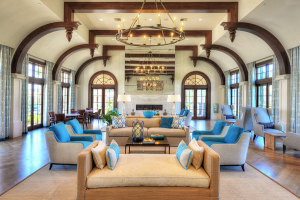 The great room — light and airy with sculpted wooden ceiling beams — offers plush seating, versatile furnishings and light-magnifying windows. You’ll also find a clubroom, outdoor patio, covered porch and catering kitchen. While the aesthetics are first rate, the space’s versatility can’t be beat. It’s as useful for grabbing a drink and catching up with a friend as it is for a 75-person meeting of your volunteer group. You have two pool choices — one competition-styled with lap lanes, the other free-form and zero entry. Kids head straight for Tamaya’s new tower water slide at the zero-entry pool, along with adults in the know. A cabana and bathrooms keep the living easy, along with enough comfy lounge chairs to host the entire Jacksonville Jaguars football team. Round the corner are four Har-Tru tennis courts and an outdoor basketball court. Back inside the Resident’s Club compound, sweat it out in Tamaya’s fitness center with start-of-the-art cardio and weight equipment. There are separate areas for each activity, plus a quiet yoga studio that overlooks a garden. Or, go your own way with a walk, run or bicycle ride on Tamaya’s community trails. These all-inclusive perks will be difficult to find elsewhere. Try if you like. We’ll wait here.